When it comes to fire safety preparation for your home, it’s important to consider fire extinguisher placement, regularly testing and replacing smoke alarm batteries, and creating evacuation plans, but unfortunately many homeowners forget to consider preparations for their four-legged friends and other pets. According to an eye-opening infographic from The Dogington Post, as many as 40,000 pets die in house fires every single year, while 1,000 fires are actually started by pets. 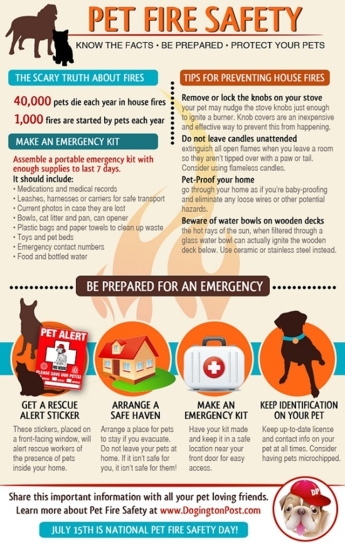 We’ll recap the key pet fire safety takeaways, and you can also view the full infographic below. A familiar exercise for parents out there, try to see your home through the eyes of a child and look for any loose wires and other potential hazards below waist level. You may also wish to consider limiting access to certain parts of the home. A couple I know uses a child-proofing gate system in order to keep their cats out of the kitchen while they cook. Also consider stove knob covers, as knobs can easily be inadvertently turned by pets, igniting a potentially dangerous burner with no supervision. A 5 pack of stove knob covers can easily be picked up for $10 or less either online at a website like Amazon, while some physical stores also carry these products. If you prefer to shop in person, check out your local Toys R Us or Bed Bath & Beyond for availability. These stickers are meant to be applied to front-facing windows, alerting firefighters and emergency personnel that pets reside in the home. This basic safety step can be critical to ensuring pet safety if you or family members are not home at the time of a fire or if you are otherwise incapacitated. The ASPCA offers a free pet safety pack in exchange for joining their email update list, which contains rescue alert stickers as well as a magnet with contact information for the ASPCA Animal Poison Control Center. While this might seem like a simple idea at first glance, most of us have been guilty of leaving lit candles burning while we’re in other parts of our home. Considering our naturally curious pets (who also happen to be attracted to light), this can create a very dangerous situation. A potential alternative to traditional candles is to use flameless candles. These battery operated candles are made of wax in order to give the same familiar look and scent of a traditional candle, but the “flame” is actually an effect created through a LED light which creates a flame flickering effect for realistic effect. Chris Stevens is a freelance writer for Kleen Pro Restoration, a Charlotte, NC based fire damage and mold remediation company.